*Today I was able to start planting in containers. After a trip to ACE Hardware to get a few more items, Paul and I spent time in the yard. *My first accomplishment was planting the tomato plants...all eight of them. I have a unique variety this year, and hope that keeping them near the house in the containers will help with their growth and production. I ordered a drip irrigation system for Paul to use for their watering. I had a system when I planted each plant. 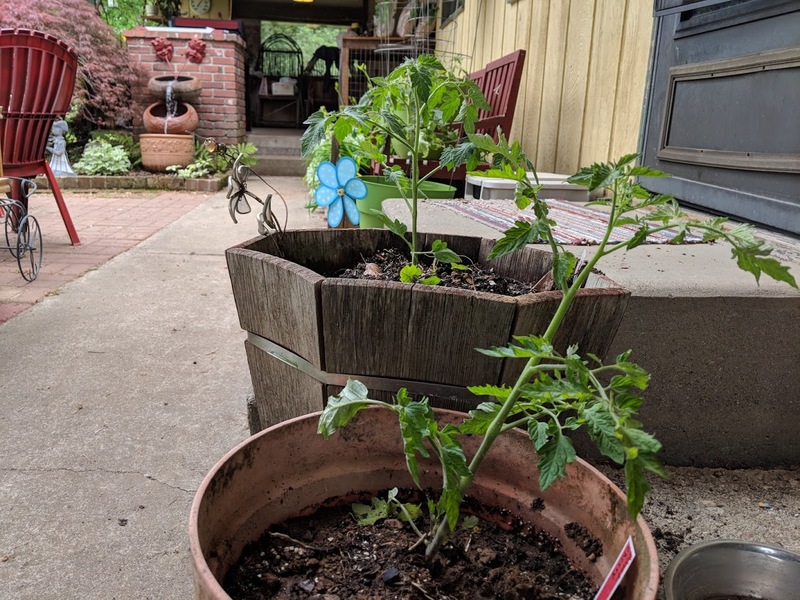 I used some of these items last year when I planted tomatoes, and I believe it helped. So this year, I added a few more items. This is what I did. I dug a deep hole in the container. I mixed up some fish fertilizer and poured it in the hole. Then I sprinkled some Epsom salt in the hole, and covered it up with a little soil, so the plant would not touch the Epsom salt. Then I added three aspirin, some crushed egg shells, a handful of bone meal and a handful of used coffee grounds. I added the tomato plant. Then I sprinkled baking soda around the base of the plant once it was planted, and worked that into the soil. Then I mixed up some Seaweed fertilizer with water, and put it in my watering can and sprinkled it all over the leaves and plant. And there you go!! Hopefully this will help me produce some very delicious tomatoes. *Most of the tomato plants I purchased from The Tomato Lady. I wanted another earlier producing plant, so I bought an Early Girl at ACE today. Here are the kind of tomatoes I planted this year: Taxi (a yellow tomato), 4th of July (an early tomato, ready in 49 days), Aurora(an heirloom tomato), Italian Plum (Milano)(early Italian plum heirloom), Paul Robeson (I am really looking forward to this heirloom. It is a black 4” beefsteak; luscious, earthy exotic flavors) , Early Girl (early, 4 oz. fruits), Elf Grape (crunchy grape tomatoes) and Black Cherry (pear shaped, sweet, brown cherry-sized fruit). *I was curious as to the difference between regular and heirloom tomatoes. Here is what I found out: Hybrid (normal) tomatoes are selected for their yield, resistance to diseases and shelf life. Heirlooms are prized for their diversity of color, shape and flavor and come from plant seeds that are at least 50 years old. We will see how each variety does this year. *I also got a lot of containers planted with flowers today as well. While filming was being done inside our house for the film Across Bank Street--Portal to the Clockworld, I made good use of my time by planting a variety of containers with flowers and herbs. I also filled our two newly acquired bathtubs with some soil, but need to get some potting soil tomorrow to add to them, and then I can plant dahlias, glads and mini roses to one bed, and a variety of shade plants to the other. I hope to get that completed tomorrow. *After the film crew and actors, including Gordan and Carolyn Turner, Grant Ray Turner, Avery Walker, Steve, Gabe and Riley Mahaffey, and Joni Bartel left, we had a nice visit with our illustrious visionary, writer and director Nancy Hanks before she headed home. Paul was in the scenes filmed today. Tomorrow evening, I go to Wallace to be a part of those scenes, which center around going to war with Zombies. Stay tuned for photographs!! *Lori Hendrix, we finished The Help and Paul really liked it and thought it was a great movie!! Thanks for sending it home for us to watch.